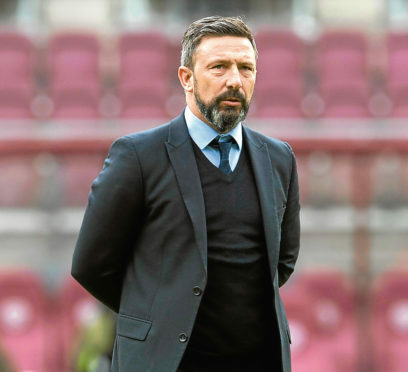 Derek McInnes has urged his Aberdeen players to go into next week’s Betfred Cup semi-final on the back of a win. The Dons face Hearts at Tynecastle tomorrow before they head to Hampden Park to face Rangers, with a place in the season’s first final up for grabs. Seven points separate the Dons from the table-topping Jambos, who have been rocked this week by long-term injuries to both John Souttar and Uche Ikpeazu. Momentum heading into the Rangers contest is key for McInnes, as he looks for an impressive performance and result in the capital. McInnes said: “It would be nice to go into next week’s semi-final on the back of a strong performance and a winning performance. It’s early on to be looking too closely at the table but at the same time we don’t want to get too far away from the teams at the top. The club announced yesterday that the SPFL had reclaimed a number of tickets for the semi-final, because sales from the Dons fans had not reached the expected level. Only 100 tickets were sold yesterday and 5,500 remain, with just over 9,000 already sold. McInnes added: “I’m just hoping we can get as many in the stadium as possible. There seems to be more focus on the tickets, kick-off time and all the rest of it than there is on the game. “Regardless of how many of our supporters are there it is just about the game next week. Hopefully we have as many of our fans there as possible and we want to sell as many as we can between now and kick-off. “I’ve said all along that it doesn’t matter where we play and when we play but that’s me and the players. We just get told what we’ve got to do but for our supporters it was important to get a better kick-off time and we have got that.